Egg Harbor Township, NJ – Hanlon Investment Management, a leading tactical investment manager announced today the availability of two new mutual funds, the Hanlon Managed Income Fund and the Hanlon Tactical Dividend and Momentum Fund. Both funds seek to attempt to limit downside risk, a goal of the Hanlon Investment Management approach for over 15 years. 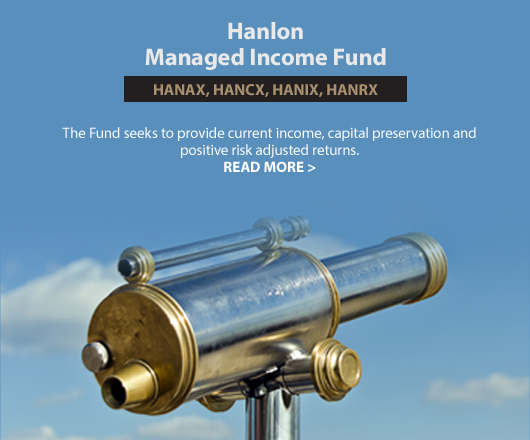 The Hanlon Managed Income Fund (HANAX, HANCX, HANIX, HANRX) seeks to provide current income, capital preservation and positive risk adjusted returns, while the Hanlon Tactical Dividend and Momentum Fund (HTDAX, HTDCX, HTDIX, HTDRX) seeks to provide capital appreciation and current income. Hanlon’s philosophy on investment management is to aid clients in achieving long‐term goals by providing tactical investment strategies to take advantage of market movements and changes in the investment climate. By exiting the market when Hanlon’s proprietary science indicates market weakness, Hanlon clients can avoid large drawdowns in their assets, while at the same time being able to enjoy the benefits of market appreciation by moving back into the markets during periods of market strength. 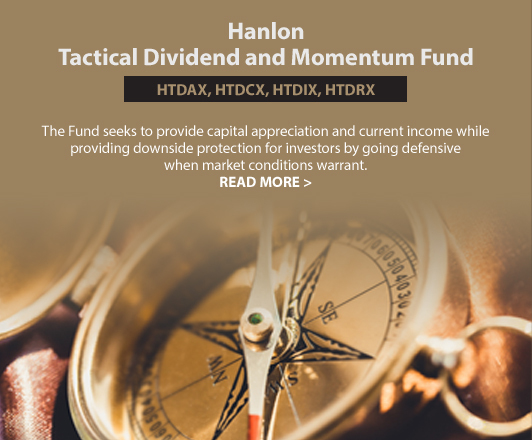 To learn more about the Hanlon Managed Income Fund and the Hanlon Tactical Dividend and Momentum Fund, please logon to www.HanlonFunds.com for their relevant fact sheets. Both funds are available in A, C, I and R shares. Investment Objective: The Fund seeks to provide current income, capital preservation and positive risk-adjusted returns. When the Fund invests in other investment companies, including ETFs, it will bear additional expenses based on its pro rata share of the other investment company’s or ETF’s operating expenses, including the potential duplication of management fees. The Fund may invest in inverse, leveraged and inverse-leveraged ETFs. Inverse ETFs generally use derivatives that are designed to produce returns that move in the opposite direction of the indexes they track, meaning that that when the value of the index rises, the inverse ETF suffers a loss. When the Fund invests directly or indirectly in fixed income securities, the value of your investment in the Fund will fluctuate with changes in interest rates. Fixed income securities that are rated below investment grade are subject to additional risk factors such as increased possibility of default, illiquidity of the security, and changes in value based on public perception of the issuer. The risk on a short sale is the risk of loss if the value of a security sold short increases prior to the delivery date, since the Fund must pay more for the security than it received from the purchaser in the short sale. The risk of loss may be unlimited. The use of leverage, such as borrowing for investment purposes, will magnify the Fund’s gains or losses. The Fund may, at times, invest in other ETFs for hedging purposes. The success of the Fund’s hedging strategy will be subject to the adviser’s ability to correctly assess the degree of correlation between the performance of the instruments used in the hedging strategy and the performance of the investments in the portfolio being hedged. Foreign (non-U.S.) securities may also be less liquid and more difficult to value than securities of U.S. issuers. The risks associated with foreign (non-U.S.) investments may be more pronounced for investments in issuers in emerging market countries. The Fund is non-diversified, and thus may invest its assets in a smaller number of companies or instruments than many other funds.